The HTML5 Web Sockets represent the next evolution of web communications. A WebSocket is a full duplex, bidirectional communication channel that operates over a single TCP socket. It has become a standard for building real time web applications. 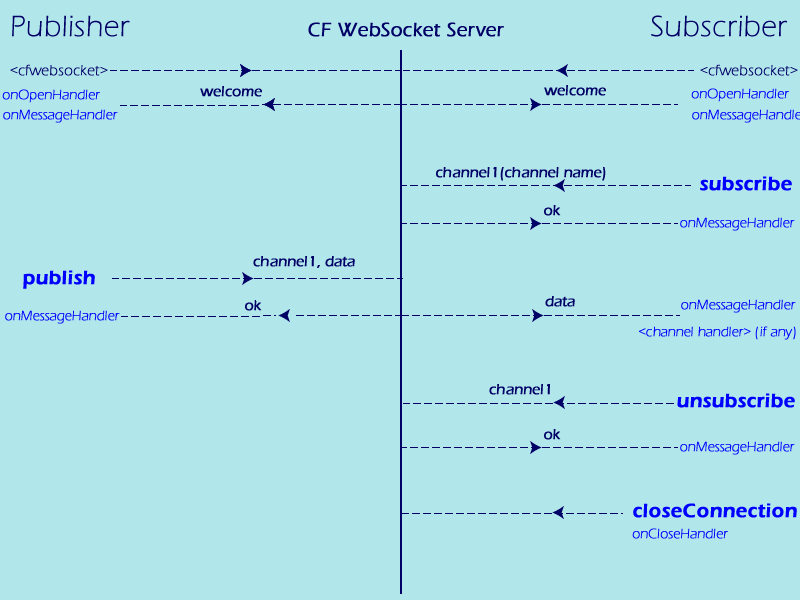 In ColdFusion 10, a messaging layer has been provided that implements the Web Socket protocol. It enables you to build applications that are based on publisher/subscriber model and applications that are based on subscriber model wherein a push from a server is possible. The websocket channels through which the communication takes place between the publisher and subscriber is specified in the wschannels variable. As observed in the above code snippet, the channel names are specified in a struct. Optionally, you can also specify the cfclistener key which contains channel listener functions for each channel (I plan to cover this workflow in my next post). I have created a sample application, you can download it here. Open two browser instances and run the cfm file. You’ll be able to see the communication taking place between the two instances when some message is sent through the channel.